Reporting on the future of Oregon's forests, from environmentalists and the timber industry working as allies on forest restoration to encroaching development on private forestland, a protective arboretum around the state’s farms and suburbs. A bill sent to Oregon Gov. Kate Brown attempts to crack down on police racially profiling citizens. It drew controversy late in the legislative process when Democrats amended it to make possession of small amounts of heroin, cocaine and methamphetamine misdemeanors instead of felonies to encourage drug treatment. Is it a business to report on racial disparities? The timber industry is mighty in Oregon—thanks to its use of tax dollars on ads. Although environmental groups have helped Democrats win big legislative majorities, the timber lobby trounced enviros in Salem once again this year. A bill to regulate aerial spraying of timberland—the subject of a sobering investigative series in The Oregonian—went nowhere. A bill to impede the export of raw logs met the same fate. Critics say that even as the timber industry’s tax burden has eased, a well-funded industry trade group has skillfully used a growing war chest to shape public perception—to the public’s detriment. Now those critics want to redirect those funds and revive a repealed tax on the industry. One recent timber industry-funded television ad shows fourth-generation logger Bob Luoto filling a glass with crystal-clear water retrieved from one of the forest’s streams. The feds disagree with Luoto. Oregon’s stream-protection rules are so lax the U.S. Environmental Protection Agency took the unprecedented step this year of nixing the state’s water-pollution plan. Nonetheless, in July, the Oregon Board of Forestry postponed a long-anticipated vote on whether to increase logging buffers along streams. Environmentalists such as Steve Pedery, conservation director for Oregon Wild, point a critical finger at the Oregon Forest Resources Institute, a semi-independent state agency that spent $1.05 million in tax money on advertising last year. Officially, OFRI’s mission is to educate the public about forestry practices, but Pedery says the agency’s allegiance to timber interests is clear. 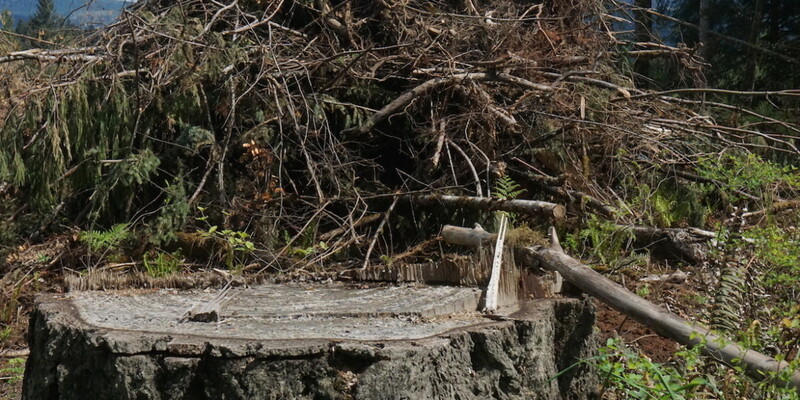 OFRI receives its funding from a volume-based harvest tax paid by timber companies when they cut trees, and the agency’s commercials paint an idyllic portrait of forestry in Oregon, despite mounting criticism of state regulations. OFRI’s tax-funded advertising campaign has put the agency at the center of a controversy over where the timber industry’s tax dollars go—and where they don’t. In the 1990s, lawmakers phased out what was called the “privilege tax” on timber. According to analysis by InvestigateWest, that decision has saved Oregon’s timber companies an average of $59 million each year, adjusted for inflation. But even as lawmakers gutted the privilege tax, they approved increases for a different tax—one that is popular within the industry. Under the current distribution formula for the Forest Products Harvest Tax, 26 percent of revenue is earmarked for OFRI, while the other 74 percent is split between forestry research and education, wildfire protection for private timberland owners, and enforcement of the Forest Practices Act—all stuff the timber industry supports. The harvest tax that funds OFRI and its advertisements is allocated by the Legislature and the OFRI board. They’ve repeatedly restricted the money to timber-related programs. That pool of money has been growing. Revenue from the harvest tax has more than tripled in the past 25 years, reaching an all-time high of almost $15 million a year ago. OFRI’s take of the harvest tax has increased on three occasions. Meanwhile, the industry’s overall tax contribution to the state has plummeted. InvestigateWest’s analysis found timber companies saved about $72 million last year thanks to the privilege-tax phaseout, even as they contributed more than ever to OFRI. Enviros and loggers agree on few things. Among their disputes: whether timber companies are paying their fair share of taxes. The unraveling of the privilege tax began in 1991, when the timber interests made the case that property tax relief for residential and commercial property owners under Measure 5 should be similarly applied to trees. After a series of incremental reductions, former Gov. John Kitzhaber and the GOP-controlled Legislature finally finished the job in 1999, eliminating the privilege tax altogether for Oregon’s industrial timber companies. Linc Cannon of the Oregon Forest Industries Council says repeal of the privilege tax was fair. Since 1972, state law has required timber companies to replant trees after harvest, supporting their argument that timber is a crop—and like other crops, shouldn’t be subject to property tax. Environmental groups want to put timber taxes back on the table as part of a broader struggle over the future of Oregon’s publicly owned forests. Since 2012, Congress has been considering bills that would increase logging on the state’s federally owned public lands as a way to boost timber revenues for rural counties. And last month, the State Land Board approved selling off the 140-square-mile Elliott State Forest to raise money for public schools. 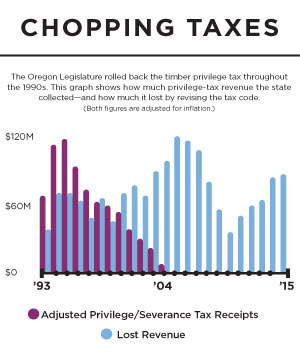 Critics say restoring the privilege tax on private timber companies could provide nearly $50 million a year for schools and $25 million for Oregon counties (assuming the state kept the most recent distribution formula). OFIC’s Cannon calls it “disingenuous” for environmentalists to blame timber companies for state and county funding woes. Environmental groups successfully sued to block logging on most public lands in the state, cutting off a key source of revenue for schools and counties. Cannon says environmentalists want the private timber industry to foot the bill for a problem it didn’t create. Ben Deumling of Zena Forest Products and his mother Sarah Deumling of Zena Woods. But as timber companies continue to funnel money into OFRI, even some timberland owners are beginning to question whether spending timber money on ads is good for Oregon. Sarah Deumling, who manages the 1,300-acre Zena Forest near Salem, is among a group of ecology-minded foresters who disapprove of the agency’s message. 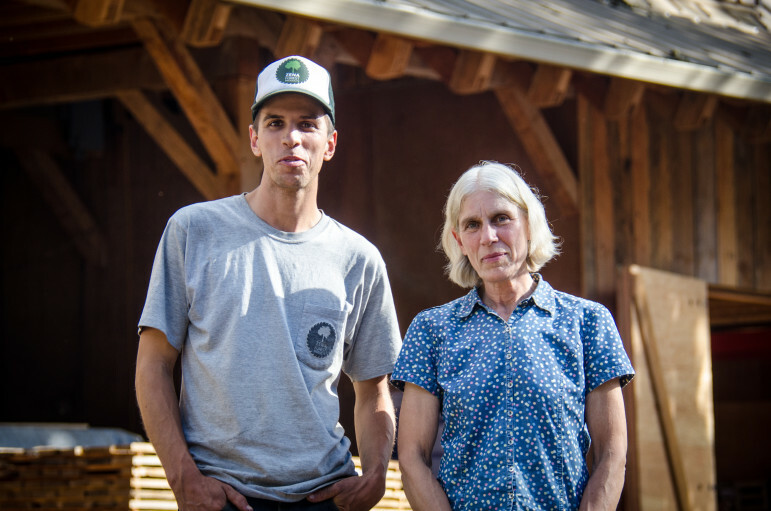 Deumling and fellow forester Peter Hayes, owner of Portland-based Hyla Woods, plan to petition the agency for a tax refund next year, an option they say is permitted under state law. Deumling and Hayes say the timber industry—led by OFRI—has tried to bend public opinion its way through rose-colored advertising. It’s unclear how well it’s succeeding. The EPA answered with a resounding “not exactly” this January, when the federal agency determined that Oregon’s logging laws do not adequately protect fish habitat or drinking water. Public opinion appears to be moving in the same direction, if only modestly. In 2012, 79 percent of respondents answered yes to OFRI’s query. In 2013, the number fell to 76 percent. A year later: 71 percent. Despite the slipping poll numbers, OFRI isn’t giving up on its campaign. The agency’s most recent commercial, titled “Amazing,” touts the state’s logging rules, including the protections for drinking water and wildlife habitat. The commercial aired during the NCAA men’s basketball tournament this spring. Thinning small trees is increasingly popular approach to dealing with a dangerous buildup of fire fuel in Western forests.